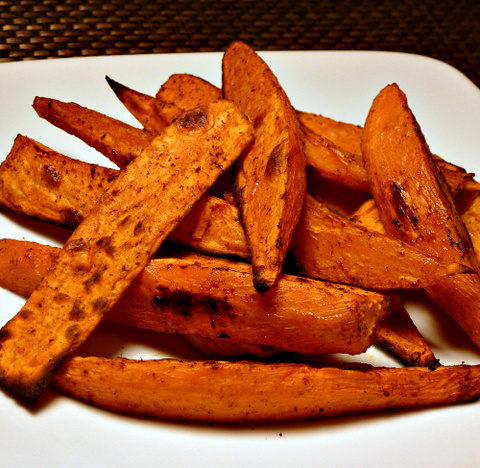 Cut sweet potatoes lengthwise in 1/4 inch width pieces. Place them in a large flat pan (like a pie pan) and sprinkle with salt, pepper and herbs de provence. Then drizzle with oil, and mix potatoes with clean hands to spread oil and seasoning evenly over the potatoes. Transfer potatoes to baking sheet, spreading them out so they will bake evenly. Place in the oven and bake for 15 minutes. Turn the potatoes over and let them continue baking for another 10 - 15 minutes until nicely brown and crispy.